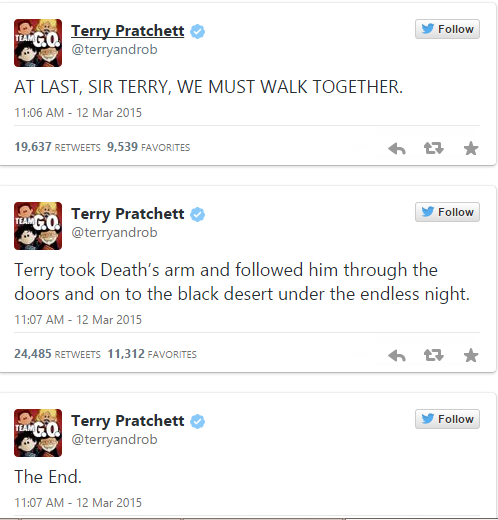 It’s with a heavy heart that I announce Sir Terry Pratchett, author of the Discworld series and co-author of The Long Earth series, has died. After being diagnosed with Alzheimers in 2007, he passed away this morning in his bed, surrounded by his family and with his cat next to him. Terry Pratchett has had a long and immensely successful career. He got his start writing as a young man when he got a job for his village newspaper, where he published short stories for children; his first novel, The Carpet People, was published when he was seventeen. It was the Discworld series, however, that made him a household name. 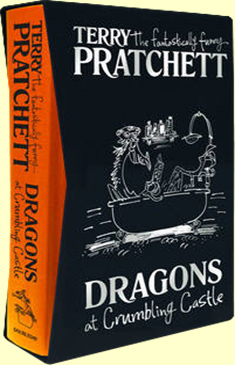 The first book, The Colour of Magic, was published in 1983, and was followed by forty-four other books in the series, with more than a dozen books connected to the series that weren’t directly in it, such as The World of Poo, Where’s My Cow?, and the various Discworld diaries, bringing the total number of books to over sixty. Unconnected to Discworld, Terry Pratchett wrote several other books, all with his trademark wit and insight; Dodger, A Blink of the Screen, Nation, and a re-write of The Carpet People all came out while Discworld was still being published. 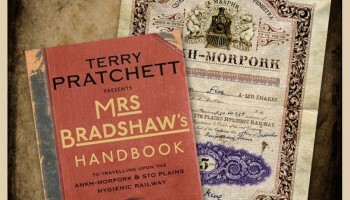 During his life, Terry Pratchett also collaborated with many people. 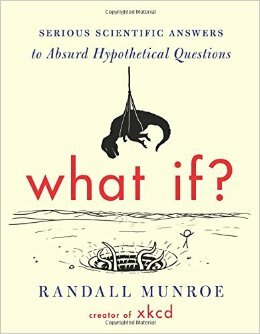 With his friend Neil Gaiman, he wrote Good Omens; with Stephen Baxter, he wrote The Long Earth series; Stephen Briggs, who started out as a fan of the Discworld series, collaborated with Terry Pratchett on the Discworld diaries and various other books about Pratchett’s most famous creation. All are masterpieces in their own right, marked with his signature style, and have captivated readers just as strongly as his own fiction. Terry Pratchett was knighted for services to literature in 2009. One of fantasy’s most beloved authors, he will be fondly remembered and sorely missed. Our hearts go out to his family and friends in this troubled time.